Posted March 18th, 2018 by Mike Boyes & filed under General Psychology, Genetics: The Biological Context of Development, Human Development, Neuroscience. Description: First let me explain the form of the title of this post. It is related to the amount of time I spent in the late 1970’s watching the Muppet Shop on TV. (Enough said, but if you actually want to understand the reference watch this https://www.youtube.com/watch?v=YU0rj6drXdI ). OK to continue with the general theme for today of fixing what we thought we knew and/or what the media mis-states about psychological research, consider the “natural experiment” taking two identical twins and sending one of them into space on an extended mission while the other stayed on Earth and then comparing the expression of their genes when the one in space returns to Earth. 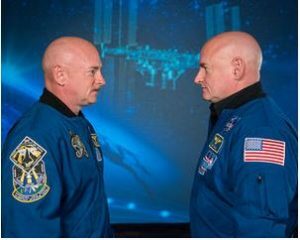 Like a LOT of research done involving twins it is called a natural experiment because one of the twins was NOT sent into space for the sole purpose of seeing if the experienced changes his gene expression compared to that of his twin. Basically he was going into space anyway, because he is and astronaut, and NASA and other researchers thought to take advantage of that as an experimental opportunity (with no random assignment though, so it is really a natural quasi-experiment). Before reading the blog linked below that talk about this study and its coverage in NASA press releases and other news stories think about this claim: the twin who went into space came back with a DNA profile that was 7% different than that of his identical earth-bound twin brother. Now read the article. Source: Twins in Space: Learning about space biology and science communication, Jaime Derringer, Why We Vary, Psychology Today. OK so, hopefully you are now clear that a 7% difference in the DNA of the space twin compared to the earth twin, would mean that the space twin was no longer human and while that would not be a stretch if this a Star Trek episode it is really just not true. The difference between genes and gene expressions is the key to seeing what was wrong about the 7% change claim. Further, there is no control data to tell us how much expression change their might have been in the space twin if he had stayed in Earth with his brother instead of going into space. We need good foundational “earth” science before we can do sensible “space” science. We (Psychology) has actually figured out that making nature versus nurture statements is wrong headed and that really we need to think and talk in terms of nature and nurture as the Psychology Today blogger, Jaime Derringer makes clear but then, once in a while, a Star Trek plot-like research opportunity comes along and we get a little carried away. Psychological science does not have to stay on Earth, but it does need to keep its feet on the ground (of what we know about how things, like genes, work)! What did the early articles talking about the twin in space study get wrong? What HAD changed in the space twin compared to the earth twin? What is a natural experiment and what sorts of things do we need to keep in mind inf we are to deal appropriately with the results such studies produce?